I was excited to see one of our monitor engineers sporting his new in-ears at rehearsal this week. A few weeks ago a new in-ear monitor manufacturer, Live Wires, came down to take impressions for anyone interested in getting custom in-ears in lieu of the house buds we provide. Live Wires provides an affordable in-ear monitor solution for those who aren’t willing or able to fork over the cost of custom in-ears which can run close to $1000+ for a good set. For $249, you can get your own set of custom, dual driver in-ears from Live Wires. They’ve been getting some great reviews so far. They fitted me for my own, and I’ll be sure to post my thoughts on them once they come in. I figure they’ve got to be pretty good because Steely Dan is using them on tour, and those guys are supposedly pretty discriminating. Our music department set the whole thing up primarily aimed at getting our band to get their own in-ears, and I was happy to see that a large chunk of them jumped at the opportunity. We also had a large showing of audio volunteers as well which is good because they’re going to be mixing for a lot of folks using these. The whole thing is very exciting for me because I have a love-hate relationship with our in-ear situation. I LOVE being all in-ears because it gets our stage volume down and gives us a whole lot more control at FOH. I HATE them because they are constantly breaking and disappearing and reappearing and too much of our budget, energy, and time is directed at the ear buds. The majority of our IEMs are Shure E5’s, but last fall I started moving towards Sennheiser IE4’s because the cost difference is huge; you can get a pair of Sennheiser IE4’s on the street for less than $100. I also chose the Sennheisers because several audio folks I have a ton of respect for preferred them over E5’s, and after demoing a pair myself for a few days I was reluctant to give them back. Unfortunately, our musicians are very used to E5’s and have been reluctant to make a switch. But now that a large chunk of our musicians will be providing their own buds, I can finally relax a bit about maintaining our inventory. While we will always retain a stock of buds, I can make it much less of a budget priority now. My guess is that within the next two years very few of our musicians will be using the house ear buds, and the expectation will be that musicians provide their own ear buds. I’m not exactly sure which direction I’m going to go, yet, because right now I lean towards phasing out all the E5’s due to my frustrations with sending at least two pairs in a month for repairs. However, what will probably happen is I will keep a larger inventory of a lower price point ear bud along with a smaller inventory of some high-quality buds for emergencies and the occasional musician who doesn’t have his own buds, yet. While I would love to just go the low budget route, the reality is that our monitor engineers and regular musicians will be using higher end stuff, and it’s always good to try and get something fairly consistent in everyone’s ears. I’m sure a day will come when monitor engineers will be able to EQ channels differently for every mix, but until then having consistent quality monitors is a better option. While the Live Wires are much more affordable than offerings by Future Sonics and Sensaphonics, they are still expensive. Our musicians are professionals so this was a great opportunity for those who have been hesitant to invest in their own buds. I wouldn’t expect a lot of churches will be purchasing these for their musicians; everyone from our teams bought their own. However, if you’ve got regular musicians looking to get their own ear buds, have them check out Live Wires. When you think about the cost of professional quality musical instruments, the $249 isn’t much; our guitarists have FX pedals they never use that cost more. Thanks for a well written review about IEM’s Shue E5’s and live wires. go after the Live Wires. been reading for a long time, however, this particular subject stood out to me. 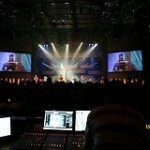 We’ve been looking to upgrade to IEM’s in the service that I lead. I had used Shure PSM200’s and E3’s when I toured, but we’ve been primarily floor wedge in my position here. I went ahead and contacted Livewires, and got my impressions made today. Right now though, we’ve got an offer for two EW300 xmitters, and 4 EK300 bodypacks, all with IE4’s, (all the G2’s) for $2360. Now, being that you’re more familiar with not only these systems, but with sennheiser, do you reckon this is as good of a deal as it sounds? We use exclusively sennheiser wireless products due to their reliability, so I would imagine these would continue to be as nice? I haven’t actually “priced” this stuff out talking to one of my sales guys so I’m going off just a quick web search. Looks like you can get the EW300 with a body pack for about $8-900 on the street new. Packs alone go for aroung $400. So you’re saving maybe $300 or so. If it’s brand new, sounds like it’s an OK deal. If it’s used, I guess it would depend on the condition of the gear. If it’s pretty beat up, I’d probably just opt to drop the extra cash and get it new because I know how we’ll treat it. I guess my question is why do you want 4 bodypacks for 2 transmitters? If you’re doubling up people on a mix, I would be cautious of that. It can be done, but IMHO when it comes to in-ears the best scenario is always one mix per person. I think you can get away with shared mixes on wedges easier because the wedges are there to reinforce what you can’t already hear on stage. With IEMs, due to the isolation they provide, the mixes need to be closer to a “CD” type of mix for a lot of players. BUT, I suppose you could set the units to mono and send the left side Mix A and the right side Mix B and then fake 4 mixes out of it if you wanted. How have the Live wires held up? Would you still recommend them? We tried the Shure E2’s but they didn’t seem to be able to handle the low’s from the bass and kick. Well, I still haven’t gotten my refit. I’ve just been too busy to go get new molds. I do know that everyone who has them seems to be pretty happy. Nobody has wanted to switch back to E5’s.